During the Ottoman Era, Greek scholarship survived through the printing presses set up by Greek refugees and migrants both in the West, but also in Ottoman controlled Romania and Constantinople. The first known Greek book was printed only 20 years after Guttenberg introduced printing to Europe. Ranging from Ecclesiastical texts to translations of the latest in Western thinking, novels and manifestos, the history of Greek publishing reflects not only the way the Geeks saw themsleves, but also their aspirations for the future. 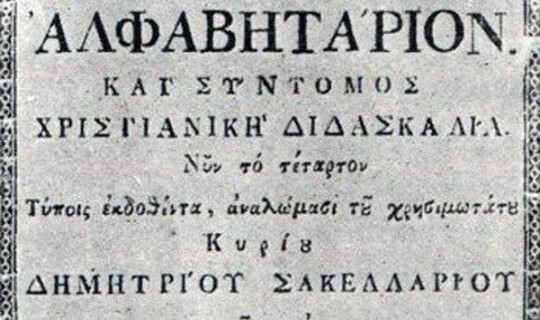 Some of the works printed would ultimately become instrumental in inspiring the Greek Revolution. Dean Kalimniou, on behalf of the Greek Australian Cultural League will provide an account of the fascinating world of the Greek printing press during the Ottoman Era. The lecture will feature an exhibition of rare Greek printed books ranging between 1550-1840. This lecture will be in Greek language and is dedicated to the memory of Petros Petranis, a Melbourne publisher and printer from Northern Epirus, who died in 2009.